Every now and then I like to give you guys a little update on my day to day makeup. My make-up collection hasn’t changed dramatically in recent years, despite how much I’d like it to. I’m really eager to get into some more high-end brands and products, but with my student budget, and little time to go out and give brands a real search and tester, the majority of my collection remains highstreet. To start off with my base, I’ve been using L’oreals 24hr Infallible Foundation in 120 Vanilla. Although potentially a shade too dark for me, blended in well, this works a dream. It’s a lovely lightweight foundation which covers redness well. I then like to go in with my Rimmel Wake Me Up Concealer in 010 Ivory. I used this concealer a few years ago and only recently started to get back into it, after finding the collection concealer to be far too heavy under my eyes and causing irritation and creasing! For any blemishes I do tend to reach for Collections Lasting Perfection Concealer in Light or Macs Studio Finish Concealer in NC15, both of which have amazing coverage! To finish off my base I powder with Natural Collections Loose Powder in Neutral Transluscent. Next are brows, which I use Anastasia’s Dipbrow Promade in Blonde which I absolutely adore! Then I move onto a bit of sculpting – for my bronzer I use Benefits Hoola Bronzer, and for highlight I’ll use their High Beam along with Sleeks Face Form Palette in fair. I also sometimes use bronzer in this palette too. If I feel like a bit of blush I’ll reach for my trust Benefit Coralista Blusher, but recently I’ve been sticking to the bronzer only! Finally, for lashes I’ve been using Rimmel’s Lash Accelerator Endless in 001 Black. I really love this mascara and have repurchased it a few times now, it always does a beautiful job of lengthening my lashes!! And there we have it! 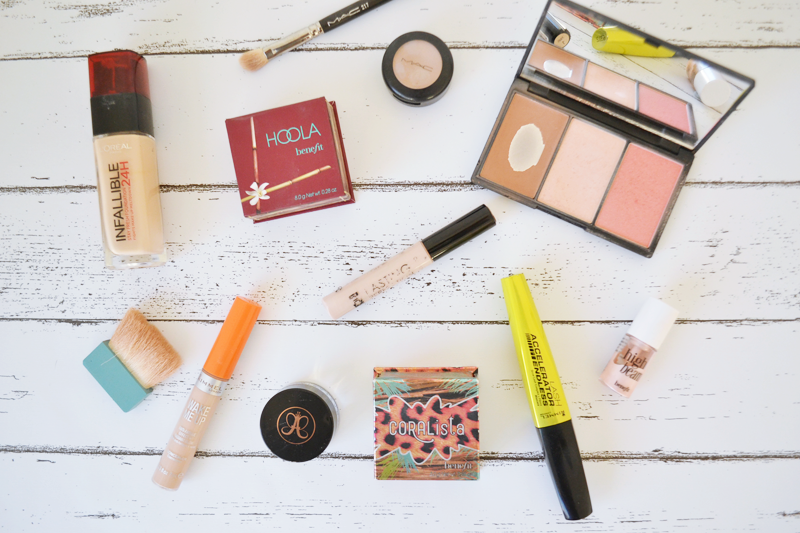 My day to day (when I can be bothered) makeup routine!